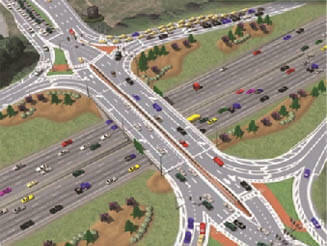 A Diverging Diamond Interchange (DDI) shifts traffic flow to the opposite side of the road to allow vehicles to enter the freeway by turning left onto an on-ramp without stopping. 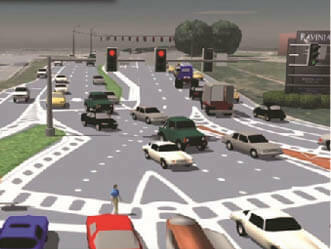 This reduces points of conflict and improves traffic flow and safety. The DDI is a proven, cutting edge, low-cost design that provides immediate traffic relief. Under normal, free-flowing traffic conditions on surrounding highways, the DDI can reduce delays in evening rush hours up to 20 percent.